The jury in the trial of a man accused of causing the death of a frail pensioner who suffered a heart attack during a confrontation outside his Warwick home has been discharged. Steven Jones, 25, who is from Warwick but of no fixed address, had pleaded not guilty at Warwick Crown Court to the manslaughter of 75-year-old William Heathcote in November 2014. The jury had heard that at 8.20pm on November 18 someone, allegedly Jones, banged on the window of Mr Heathcote’s home in Pickard Street, Warwick. Prosecutor Ben Aina QC said that was intended to taunt the pensioner, known as Bill, who had suffered from a stroke in 2007 and also had a heart condition. The pensioner, still in his bare feet, came out in a state of annoyance, holding a broom with the handle-end away from him and shouting at Jones to go away. He began swinging at Jones, who laughed and dodged out of the way, ‘taunting him by his presence’ according to Mr Aina. “At one point Bill was able to hit Steven Jones on the shoulder with the broom, but Steven Jones just laughed and then ran towards his young friends,” said Mr Aina. “It was at this point Bill suffered a heart attack and collapsed. An ambulance was summoned and he was taken to Warwick Hospital, but was declared dead at 9.35 in the evening. The pensioner’s body was subsequently examined by consultant forensic pathologist Professor Olaf Biedrzycki who told the jury the direct cause of death was ‘acute left ventricular failure,’ with high blood pressure as a secondary element. Prof Biedrzycki said Bill had widespread fibrosis in the left side of his heart, which was evidence that he had suffered heart attacks in the past, and there was also a build-up of fatty deposits in the arteries limiting the flow of blood to the heart. Prof Biedrzycki explained: “He could have died at any time, without a stressful situation. But any additional stress would have made his heart beat harder and faster, which would have put him at risk of having a sudden heart arrhythmia. In addition to the manslaughter charge, Jones has pleaded not guilty to intimidating a teenage witness. 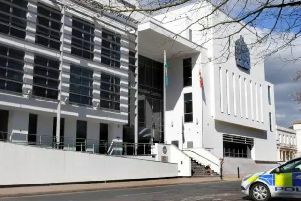 He and Frankie McDonagh, 19, of Cherry Street, Warwick; Paige Tomlinson, 18, of Mercia Way, Warwick, and Stephan Reilly, 19, of Willes Road, Leamington, also denied perverting the course of justice. It was alleged that to protect Jones, they had agreed to tell the police another group of youngsters had been responsible. But as the trial entered its third week, the jury was discharged for legal reasons which cannot be disclosed. Before being discharged, on Judge Richard Griffith-Jones’s directions, the jury found heavily-pregnant Tomlinson not guilty of conspiring to pervert the course of justice. Her barrister Ben Nicholls had submitted, in the absence of the jury, that there was insufficient evidence for the case against her to continue – and the judge agreed. So the jury formally returned a not guilty verdict on Tomlinson, who was discharged from the dock.